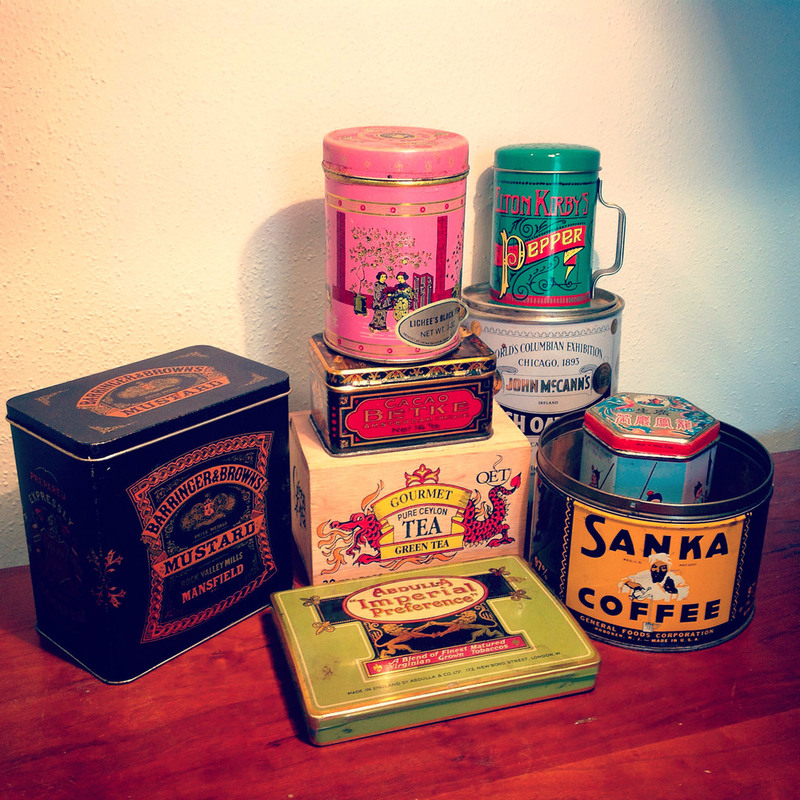 A small sampling of my vintage tin collection. I've never been a huge collector of things. I tend towards the minimal in design and consumption. But in preparation for Lilla Rogers' Make Art That Sells Home Decor class that starts tomorrow, one of our assignments was to photograph a collection, and I realized that I do have a few minis. Not dozens of things, or things that have been amassed over decades, but mini collections of special things. The one I chose to photograph was my decorative tins, many of which house my studio pencils, pens and paintbrushes. Most of them were found on Etsy or in antiques shops over the years. And I suppose they must have, at least subliminally, influenced my work a few times. My favorite is the Sanka Coffee container. I love the bold orange and black, the typography, the design. (We'll save the discussion about the stereotypical caricature rendering for another day...) One thing all these tins have in common is their beautiful illustration and/or design. There was a time when only professionals were hired to create packaging and commercial art. There is a reason we love finding old signage from the 1920s and 1930s. Great care was taken in designing and crafting signs and products. There were some precarious decades in the early personal computer era when anyone with said computer felt compelled to take on the job of design. I'm happy to see better design all around these days. Even if not created by a 'professional', the general public design aesthetic seems to have matured or refined.